Hives, also known by their medical name of Urticaria, are raised, flat-topped bumps that are smooth to the touch and typically red in color. They can be incredibly itchy and are typically accompanied by a stinging or burning sensation. A hives rash can appear anywhere on your body and can be as small as a pencil eraser or as large as a dinner plate. Hives can also join to form extremely large areas that are called plaques. Finding the exact cause of your hives rash can be nearly impossible, however there are a few well known causes that include stress, food allergies, allergies to bug bites or stings, contact with animals or plants, medications, cold, heat, excessive perspiration and over exposure to the sun. Some of the most common foods that cause hives outbreaks are chocolate, milk, fish, eggs, fresh berries, nuts and tomatoes. If you are not using the right hives treatment you should avoid these foods. The most common medicines that have been shown to cause a hives rash are non-steroidal anti-inflammatory medications (NSAIDs) like Ibuprofen, Advil, Aspirin, ACE inhibitors (such as heart and blood pressure medications) and codeine. Arthritis medications and antibiotics have also been linked to hives outbreaks. How Do I Get Rid of My Hives? Over the last 20 years, doctors have prescribed a multitude of different over the counter and prescription hives treatments, from creams to pills to steroids to homeopathic remedies. The early hives treatments had high rates of negative side effect, but there are certain hives treatments that don't these days. Be sure to educate yourself on which treatments to avoid before starting any prescription. Most people consider hives to be more annoying than dangerous, however a hives rash can indeed be deadly if not treated properly! This is especially true if your hives outbreak is accompanied by a fever, swelling in the throat, wheezing, or shortness of breath. In fact, around 33% of hives suffers can also have swelling of the tongue and throat, which is known as angioedema, and is caused by swelling beneath the skin instead of on the surface. This type of swelling beneath the skin can also cause stomach pain and cramps which is typically quite painful. If you find that your hives rash is causing your breathing to become difficult and labored, you should seek immediate emergency treatment. A hives rash can last for weeks if not treated properly, however most cases only last several days or as little as several hours if you are lucky enough to have a less severe hives outbreak. Believe it or not, over 20% of the world's population suffers from hives! unfortunately, over 80% of all hives cases are never diagnosed and treated. A hives rash can appear anywhere on your body, including on your face, lips and ears and even in your throat and on your tongue. What Should I Avoid When I Have a Hives Outbreak? If you are experiencing a hives outbreak, be sure to avoid taking a hot shower or bath which can further aggravate your skin. This unfortunately means that you'll be taking cold showers until the outbreak ends, however you can shorten the duration of your outbreak or even prevent them with the proper hives treatment. In addition, any skin irritation caused by excessive touch or tight clothing and underwear will cause even more outbreaks without the proper hives treatment. If you are not using the proper hives treatment, you should also avoid getting hot and sweaty as this will make the outbreak even worse. You should also avoid taking pain killers such as Ibuprofen, Advil, Aspirin and codeine. Laxatives, diuretics and barbiturate should also be avoided as these too will make your outbreak worse. Cold hives are one form of hives that can easily turn deadly. People who have cold hives have an allergic reaction to cold temperatures that can cause them to lose consciousness and drown to death if the outbreak occurs while swimming. Chronic hives are hives that lasts longer than 6 weeks. Chronic hives can actually affect the internal organs like the muscles, GI tract and lungs. Some of the symptoms include muscle soreness and weakness, vomiting, diarrhea and shortness of breath. Body hives are a type of physical hives that occurs over the entire body, with no bearing on the initial area bothered. Body hives can be very serious and can cause fainting, breathing issues due to swelling and even death. Heat hives is caused by your body having an allergic reaction to heat. Heat hives is basically the condition of being extremely sensitive to heat or the response of sweating. Stress hives develop due to chronic stress or tension in your life, and have the usual hives symptoms of red raised, itching rash like appearances. When you develop stress hives, be sure to find an immediate way of relaxing to help your stress hives subdue. Sun hives are a type of chronic hives that is directly caused by sunlight exposure. Most people that suffer from sun hives have redness and itching hives on the areas of skin that are most exposed to sunlight. What Are Hives On Feet? Hives on feet on feet are itchy, red, raised welts on the surface of the skin that seem to appear out nowhere. They are typically brought on by an allergic reaction to something that made contact with your feet. What Are Hives On Hands? Many people get hives on their hands from the top to the palms of their hands. Learn what causes hives on hands, what the symptoms are and how to get rid of them. What Are Hives On Face? Hives on face are raised, flat-topped bumps that are smooth to the touch, typically red in color and commonly referred to as facial hives. They can occur anywhere on your face and neck, including the lips, eyes and ears. Viral hives are a type of hives that are caused by a viral infection. Viral hives are usually accompanied by a fever and appear on your skin as raised areas that are surrounded by red halos with very defined edges. How Are Thyroid & Hives Related? For almost 20 years now, thyroid and hives has been closely related in about 10% of cases. Some people with chronic hives have a high level of anti-thyroid antibodies in their system, which can cause a hives rash. Skin hives are medically referred to as Urticaria and are an outbreak of red bumps and swollen areas on the skin that suddenly appear. Skin hives cause itching at times, and some people have a burning sensation wherever they appear. Severe hives are also known as chronic hives and are considered any case of hives that lasts longer than 6 weeks. If your hives last less than this time frame, you could simply have acute hives. Pregnancy hives are areas of your skin that are raised and red with a pale colored center that itch severely. Pregnancy hives are common in women of all stages of pregnancy due to the amazing amount of changes your body is going through. Baby hives are a case of hives that affect babies and toddlers. Baby hives are also called urticaria and welts, which are swollen spots on your baby’s skin. Hives on toddlers are also called urticaria or simply welts. These are swollen areas on the surface of the skin that can vary in size and location, but have well defined edges with a pale center and a red border. Angioedema is very similar to hives in that there is swelling of the skin, except that the swelling is not just on the surface of the skin, but deep underneath the skin. This swelling is caused by your immune system pumping fluids into the affected area as a way of combating the allergen that is affecting the area. Urticaria are itchy raised, red welts on the surface of your skin that can appear anywhere on your body. They are usually brought on by an allergic reaction to food, medicine, sunlight or some other allergen. Urticaria is also more commonly known as hives and is curable 95% of the time with the right urticaria treatment. What Type of Hives Do I Have? There are many types of hives. 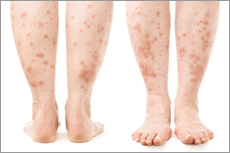 This includes acute urticaria, chronic hives, physical urticaria, hereditary angioedema and dermatographism. Dermatographism is simply known as hives that form after the skin is scratched or firmly touched, and these can occur at the same time as other types of urticaria. Physical urticaria are hives that are caused by direct skin stimulation meaning exercise, sweat, pressure or vibration as well as cold or heat. This type of hives generally is seen in the exact location the skin was stimulated, and very rarely are they seen in other areas. Most times, this type of hives case is seen within an hour of the exposure. Chronic urticaria or angioedema is a case of hives that lasts longer than 6 weeks. This is harder to identify than acute urticaria, and for most people the cause goes unknown. This type of hives can actually affect the internal organs like the muscles, GI tract and lungs. Some of the symptoms include muscle soreness and weakness, vomiting, diarrhea and shortness of breath. Learn more about chronic hives. Acute urticaria is a case of hives that lasts less than 6 weeks, but is still equally intense. This type of hives is generally caused by food, infection or medicines as well as insect stings or bites and internal diseases. Hereditary angioedema is a more serious condition which involves painful swelling over the entire body, including your internal organs. It is referred to as hereditary hives as it is passed on through families. Recent studies have shown that 1 in 100,000 people have hereditary angioedema. In fact, the most common symptom of hereditary angioedema is swelling of the stomach area, which can result in severe stomach pain and unnecessary surgery if misdiagnosed.